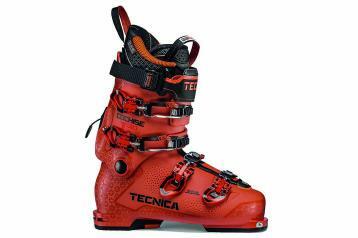 The 2018/2019 Tecnica Cochise 130 Dyn was tested in the men's On-Off Area medium width category at Silver Mountain Resort by the experts at America's Best Bootfitters, powered by Masterfit. Testers agree that the 2019 Tecnica Cochise 130 Dyn is one of the very best of its kind because you don't have to give up descent performance and top-shelf alpine boot fit standards to gain a releasable cuff for hike and skin missions. The 99 mm last width is a smart choice for most good skiers looking for a locked-in fit for the heel, ankle and lower leg shaft while maintaining a little breathing room for the ball of foot and toes—that was especially nice for touring, testers mentioned. Performance-wise, the team unanimously affirmed that it drives a ski well—skinny or fat, on soft or hard. The ankles and heel are particularly well designed to hold the foot in place for skiing movements, and the forward part of the lower boot offers some forgiveness in fit tension. Testers commented that they liked the padded feel of the liner in the cuff and along the shin, and felt that it maintained the same even, comfortable fit while in hike mode as well. One key to the Cochise's broad power band and stability on edge, at speed, is its plastic—polyether upper cuff and lower shell—real alpine boot stuff. No skimping for the sake of weight—instead the shell wall thickness is reduced in non-critical areas to shave ounces while maintaining strength. We like that. Testers noted the foot-feel through the boot floor to the ski is exceptional, and while this boot might not compare to piste-centric Frontsiders, it's pretty darned close. For where and how skiers will be using this boot, it has plenty of horsepower for 99% of skiers. You want more juice? Can the hike mode. You want the mobility and touring options? Then this is the best you're gonna do. As with the Mach1 boots, the Cochise line-up features the Custom Adaptive Shape (C.A.S.) menu of boot-guy-approved design elements. The C.A.S. shell is dimpled in common trouble zones to make heat stretching easier, more-defined and better-lasting. The C.A.S. liner is both highly moldable and grindable due to its high density microcell EVA foam exterior. The Dynafit-certified tech fittings (hence the Dyn suffix) enable the use of lighter weight "low tech" touring gear, and a set of rockered backcountry soles is available as an accessory purchase. Lightweight Lift Lock buckles are sweet for locking them open during entry and exit or while touring—no accidental re-latching.